Can my co-parent book airline tickets and travel out-of-state with our child? Does he/she need my consent first? Is our child allowed to leave Nebraska with either parent? The country? These questions are common for parents transitioning into their new normal of co-parenting. With the holidays right around the corner, you may be wondering what rights you have to take your child out of state. Or, perhaps your co-parent has already booked plane tickets, but you disagree with your small child flying on an airplane. Can anything be done? Parents have the right to spend holiday or vacation time with their children, and generally there is no restriction regarding where that time can take place. Parents can take their children out of the state during their parenting time, unless the court has ordered otherwise. 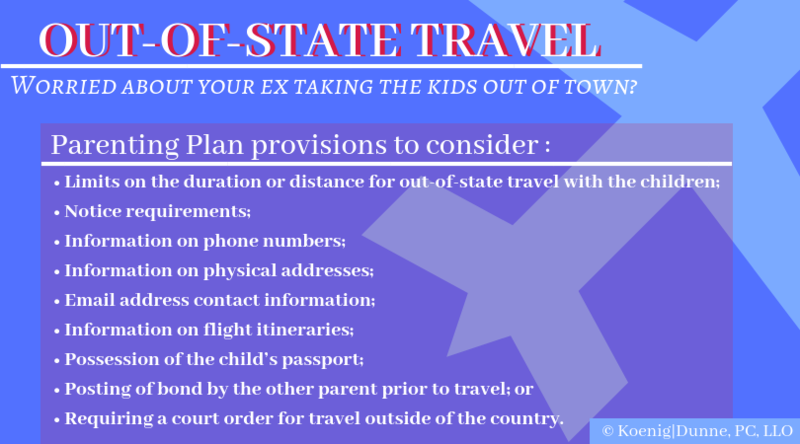 Consent from the non-traveling parent is usually not required for out-of-state travel. Requiring a court order for travel outside of the country. Judges are not ordinarily concerned about short trips across state lines, but you should let your family law attorney know if you are concerned that your child may be abducted by the other parent so reasonable safeguards may be put in place. If you strongly object to your co-parent traveling out of the state with your child, you may ask the court to decide whether it is in your child’s best interests that he or she be permitted to travel with your co-parent. Important Note: Neither parent can permanently remove a child from Nebraska without securing the court’s permission. If you (or your co-parent) is moving to another state and you (or your co-parent) would like to move your child as well, contact your attorney immediately to discuss your rights. Your child may have never left the state without you before, but now, in your new normal, it is bound to happen. Talk to your Koenig│Dunne attorneys if you have serious concerns about your child’s out-of-state travel and see whether certain precautions may be put into place to give you some ease of mind.